This is written as a story told by Dr Callum MacKenzie about his time in Uganda. He has been paid a lot of money to eradicate a smallpox epidemic, but all is not as it seems. There are plots and counterplots. It is not a safe place to be and more than one person has a love of killing. The book is written in a compelling way so that you don’t want to put it down. I highly recommend this book. Enjoy. 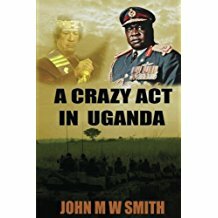 A Crazy Act in Uganda costs £7.33 in paperback from Amazon or in Kindle format 99p. The link is here.